(TibetanReview.net, Feb04’19) – China’s official media confirmed Jan 31 that a county government in Qinghai Province had ordered temples to stop holding “illegal” Tibetan language classes for students during holidays, contending they infuse students with ideas threatening social stability due to lack of teaching qualification. Some Buddhist temples in Nangqen (Tibetan: Nangchen) County of Yushu (Yulshul) Prefecture had been “secretly organizing Tibetan language courses to students on holidays,” reported globaltimes.cn. Students attending those classes included college students on return to their hometown from other cities as well as primary- and middle-school students, the report cited an official surnamed Jiang from Quji village as saying. Jiang has said his village received the county government’s notice at the end of Dec 2018, ordering it to rectify temples that were providing unqualified “teaching activities”. 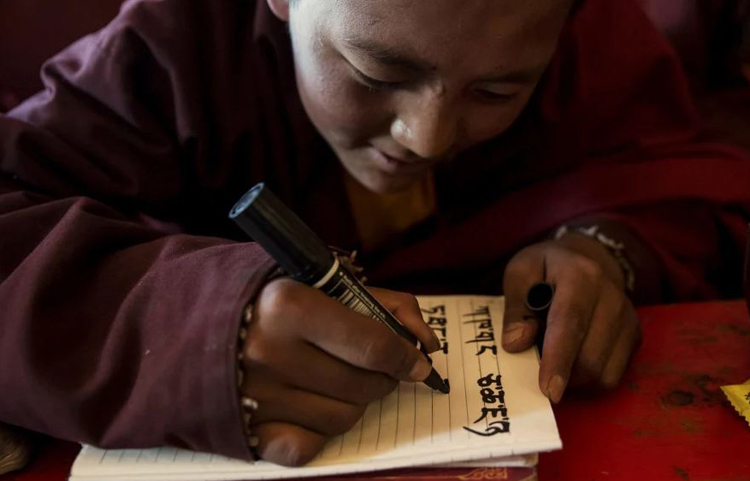 The report sought to dismiss as false claims attributed to some monks that students, especially those who are studying in other parts of China, had few opportunities to be exposed to the Tibetan language. Besides, “the Nangqen government has always been promoting bilingual education (Putonghua and Tibetan) in schools, and encourages students to learn Tibetan in qualified institutes,” Sonam, an official from the Nangqen publicity department, was quoted as saying. The report did not say what constituted a qualified institute, or how classes organized by monasteries infused students with ideas threatening social stability. Besides, under China’s so-called bilingual education, Tibetan is taught only as a marginalized language subject. And yet, the report claimed that the Qinghai government had invested 640 million yuan ($95.36 million) from 2012 to 2017 to push bilingual education, including the construction of teaching venues and hiring people. It was also claimed to have implemented preferential policies for ethnic minority students from the Tibetan Prefecture to teach the Tibetan language. The report correctly cited the Constitution of China as saying all nationalities have the freedom to use and develop their own spoken and written languages and to preserve or reform their own customs, although implementation has always been altogether another matter. The report cited the official Xinhua News Agency as having reported that the ethnic textbook centre of Qinghai had compiled and translated more than 1,800 textbooks in Tibetan since the 1980s, amounting to 200 million words. However, this was apparently before mandarin Chinese was made the only medium of instruction in all subjects for Tibetan schools in the province some years ago.